Prem Ratan Dhan Payo trailer collects 4M Views & 5K Dislikes in a Day! Prem Ratan Dhan Payo trailer collects 4M Views & 5K Dislikes in a Day! Home > sonam kapoor > Prem Ratan Dhan Payo trailer collects 4M Views & 5K Dislikes in a Day! Prem Ratan Dhan Payo trailer collects 4M Views & 5K Dislikes in a Day! Fans of Salman Khan are really happy today because the trailer of film PRDP has collected around 4M views on YouTube, but nobody noticed that the trailer has also collected 5K (5,000)+ dislikes in a day! It's a huge amount of dislikes for Salman Khan's film. Salman Khan's Bajrangi Bhaijaan hardly got 4K dislikes in 4 months, Kick trailer received 10K+ dislikes in a year! But, this one is really bad, much more was expected from the trailer but it didn't satisfied most of Salman fans & other audience. See Also : Vijay's Puli overtakes Salman Khan's Kick on YouTube! Trailer just failed to impress the audience and as usual it collected the highest amount of dislikes in a day! But, whatever! It's Salman Khan's film & everyone gonna watch it, and also we hope another trailer will come soon & include some good scenes from the movie? And let's forget about the dislikes thing, the trailer has also collected 65K+ likes! The Indian family drama film is written and directed by Sooraj Barjatya. Salman Khan will be seen in a double role. As 'Prem' he is a Prince while 'Vijay' is a fighter. It also stars Sonam Kapoor, Neil Nitin Mukesh & Anupam Kher. 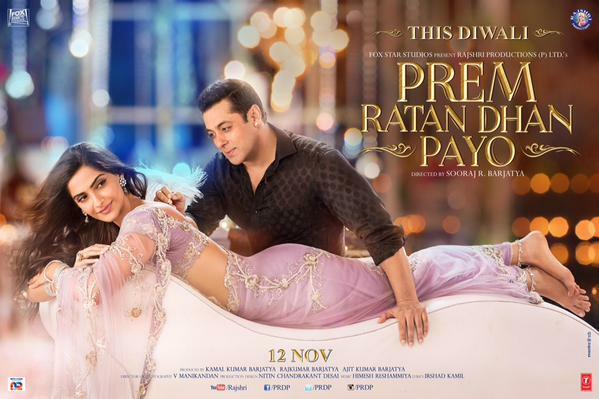 PRDP is scheduled to release on November 12th, 2015. So, friends we would like to know did you enjoyed the trailer of the film? Did this fulfilled your expectations? Comment below your review for the trailer!